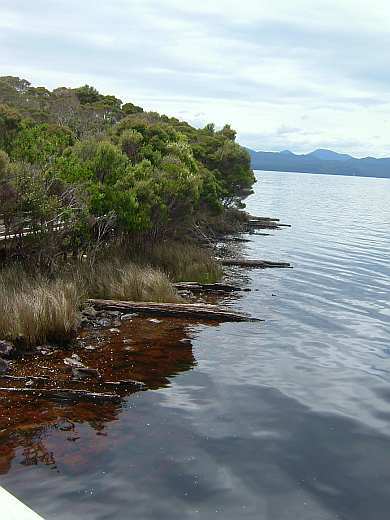 The Collingwood and Franklin rivers flow through deep valleys and uninhabited mountainous rainforest country then merge as the Gordon River to flow into the Macquarie Harbour on Tasmania's west coast. 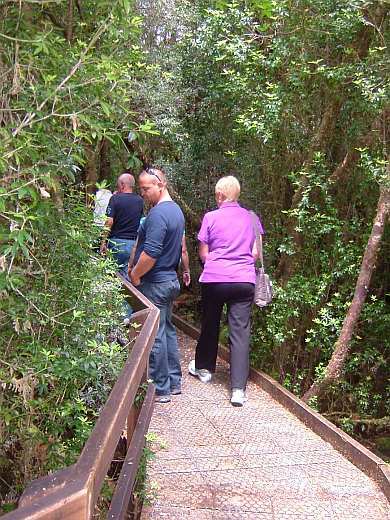 The lower part of the Gordon River is part of the World Heritage area with rainforest and rare trees such as the Huon. 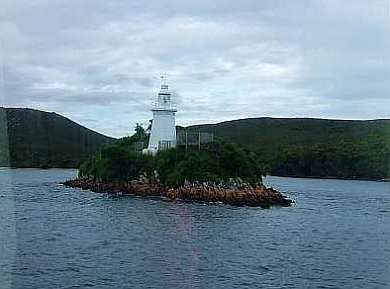 The water in rivers in western Tasmania are drinkable but stained brown from the button grass tannin growing in the catchment area and ancient trees are mirrored in the dark waters reflected and rippling in the ship's wake as we cruise first to the Harbour Mouth - a narrow entry called Hells Gates. 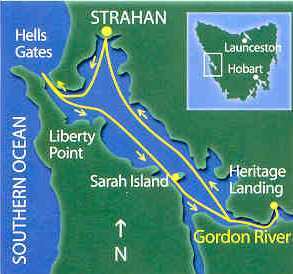 We see distant rings of aquaculture pens and next stop at Sarah Island to see the ruins of the penal settlement and learn about the harsh conditions in the 1820's convicts judged to be intransient experienced. At the Heritage landing we follow the boardwalk which winds its way through the rain forest and learn of the Huron Pine walking among trees 1000 years old. Back on board we enjoy a fabulous buffet lunch featuring Macquarie Harbour salmon harvested from the salmon farms. On our return to Strahan, some elected to take the wilderness train back to Queenstown - remaining group members were demonstrated milling of Huon pine at the Strahan wharf and learn of the role this unique timber played in the settlement of the area before returning by road and exploring the mining township of Queenstown.